"I get requests for this recipe all the time! I have made it with chicken and leftover Thanksgiving turkey as well, but beef is my favorite!" Combine beef roast, tequila, jalapeno peppers, and garlic in a slow cooker. Cover and cook on Low until tender, 12 to 18 hours. Shred beef using 2 forks; let it cool, about 30 minutes. Transfer shredded beef to a plate using a slotted spoon, reserving cooking liquid in the slow cooker. Pour reserved cooking liquid into a large pot; stir in rice. Bring to a boil. Reduce heat to medium-low, cover, and simmer until rice is tender and liquid has been absorbed, 20 to 25 minutes. Mix black beans, refried beans, and 1 can green chile peppers together in a bowl. Mix spicy enchilada sauce, mild enchilada sauce, and tomato paste together in a bowl until smooth. Spread a thin layer of sauce in the bottom of a deep baking dish. Spoon 1/4 cup bean mixture, 1/4 cup rice, 1/2 cup shredded beef, 1 tablespoon sauce, and 2 tablespoons Mexican cheese blend over 1 tortilla. Roll up tortilla and place seam side-down in the baking dish. Repeat with remaining ingredients until baking pan is full. 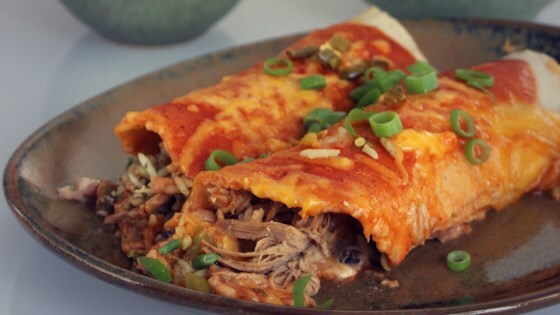 Cover tortillas with a thick layer of sauce and remaining cheese. Spread remaining 1 can green chile peppers over cheese. Bake in the preheated oven until cheese is bubby and golden brown, 45 minutes to 1 hour. Flavorful ground beef enchiladas covered in a spicy red sauce!